seen them at home – honored representatives of the great saurian of an older creation. 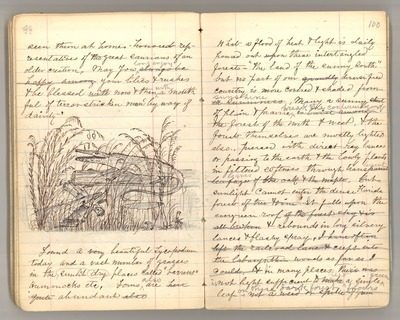 My you long enjoy your lilies and rushes and be blessed now and then with a mouthful of terror-stricken man “by way of dainty.” [Drawing of alligator] Found a beautiful Lycopodium to-day and a vast number of grasses in the dry sunlit places called “barrens”. Hummocks, etc. Ferns also are abundant. What a flood of heat and light is daily poured out on these inter-tangled forests – “The land of the sunny south”, but no part of our diversified country is more covered and shaded from sunshine. Many a sunny street of plain or prairie breaks the continuity of the forests of the North and West, and the forests themselves are mostly lighted also, pierced with direct ray lances or passing to the earth and the lowly plants in filtered softness through translucent leaves. But sunlight cannot enter the dense Florida forests. It falls on the evergreen roof and rebounds in long silvery lances and flashy spray. In many places there is not light sufficient to feed a single green lead on these dark forest floors.